We've recently published the 2017 update to this report. Click here to see the main report with data broken out by age and here to see the data broken out by geography. Today, HubSpot believes we’re in the beginning of another period of major change -- where a number of innovations and shifts (to AI, bot platforms, voice based search, and further proliferation of video content, coupled with mobile-first consumers coming of age) will have a big impact on how marketers, and businesses in general, get things done. This report will delve into key shifts we've been observing: Changes in overall browsing behavior, new content consumption preferences, adoption of voice search, and increased viewership of video content. The data in this report reflects our global audience. In our survey of 1,091 global internet users, we’ve found people have dramatically increased content consumption on the three most popular social networks in the last two years: Facebook (+57% increase), Twitter (25% increase), and LinkedIn (21% increase). These networks have notably doubled down on content in the past few years to capture and retain the attention of their users -- and it appears the playbook is working. We also see that use of mobile notifications have also increased substantially (34%). In contrast, traditional content aggregators like Feed.ly or RSS feeds are seeing much slower growth in usage compared to 2 years ago. Impact to marketers: These browsing habits will require content distribution approaches that many business have not yet undertaken -- spreading out their content onto different platforms instead of hosting it on their website. We’re finding where consumers go, content has followed, whether it's dispersed to a social network or consumed through mobile aggregators. "Where consumers go, content follows." As Facebook and other social network start to dominate with content, marketers need to ensure their content is on these networks. Likewise, your technology stack must support mobile responsiveness for mobile browsers that find your content directly. People go online to consume content. Their options are endless. 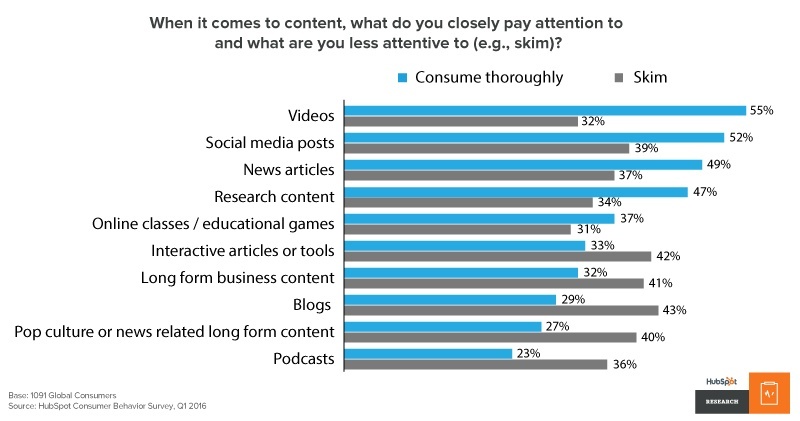 For content marketers, knowing what type of content generates the most attention in readers has always been important. We asked our respondents what they tend to skim and what they read or watch thoroughly. Not surprisingly, video was listed as the type of content people pay close attention to, followed by social media posts, and news articles. Blog posts, interactive tools, and long form content are more likely to be skimmed by readers. People want to see more social posts and news articles in the future, which is expected. 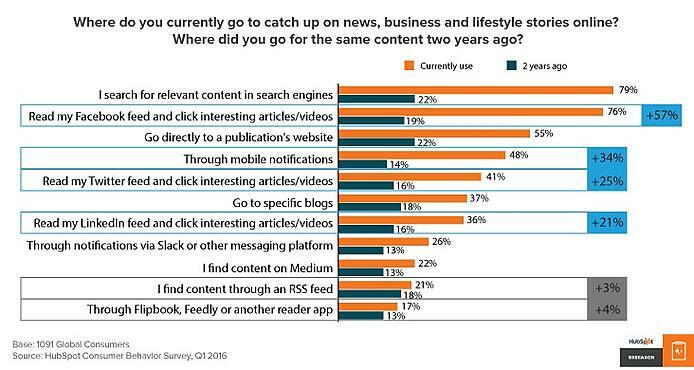 The next forms of content on the list, however, reflect people’s changing browsing behaviors. Video ranks very highly, followed by online courses, research content, and interactive tools. Traditional content like blogs, longform articles, and podcasts round out the list. Impact to marketers: Because most online browsers voraciously consume all content formats, this isn’t a call to abandon certain content types. Rather, marketers should focus their content to reflect the reading or skimming habits of their audience. Blogs posts should be digestible. Long form content needs to have clear headlines and structure to allow for skimming. If you want to make a big impact and keep people’s attention, video is the best place for you to make your case. Marketers should also make sure they are placing themselves in channels like video, or consider creating interactive or educational content to meet the needs of their audience. 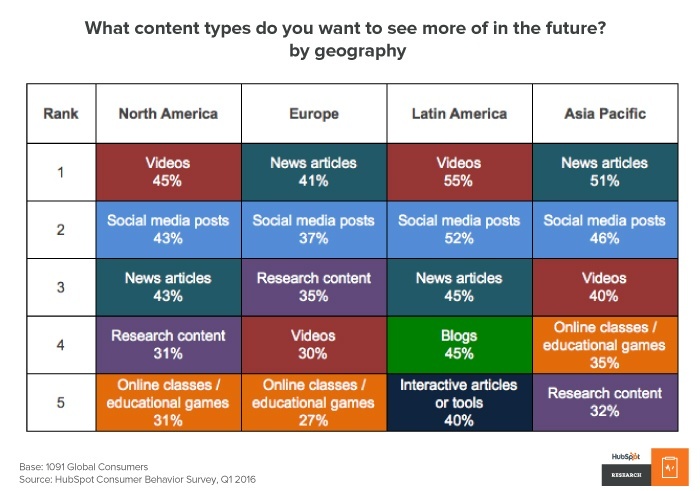 Globally, there are some regional differences in future content preference. In Latin America, video is top ranked, followed by social media posts, blogs, and interactive tools. Online browsers in the APAC and LATAM want more business related content and educational resources compared to other regions. EMEA based respondents are less enthusiastic about video, which is lower ranked compared to research content. Impact to marketers: If you’re focused on a specific geographic market, tailor your content to the region’s needs and preferences. A blog that works in Latin America may not get the same traction in Europe. To gauge people’s browsing habits, we asked respondents what they considered their primary device to access the internet. An impressive 33% said their primary device was their phone. 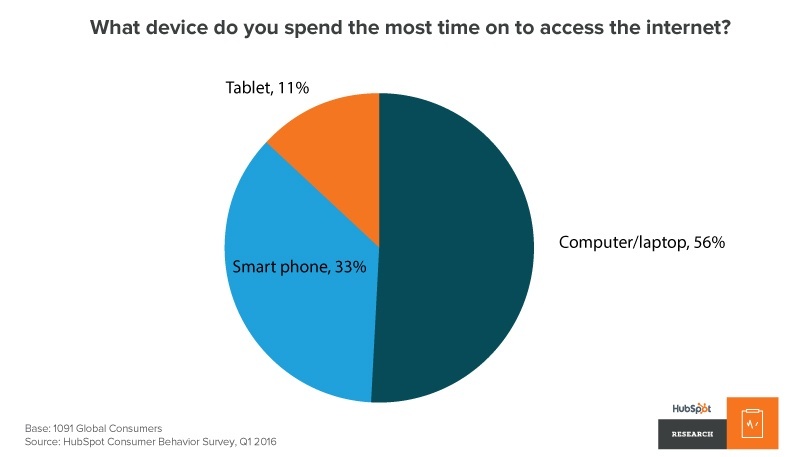 Coupled with tablets, 44% of our survey respondents are access websites and content using devices running a mobile OS. Unsurprisingly, people who use their smartphone as their primary device are more likely to want mobile content notifications or text/messenger notifications. Newer notification options, like desktop notifications and messenger app notifications have a small potential audience currently. Given that desktop notifications are being pushed out by big players like Facebook, we expect to see more openness to receive these notifications in the future. 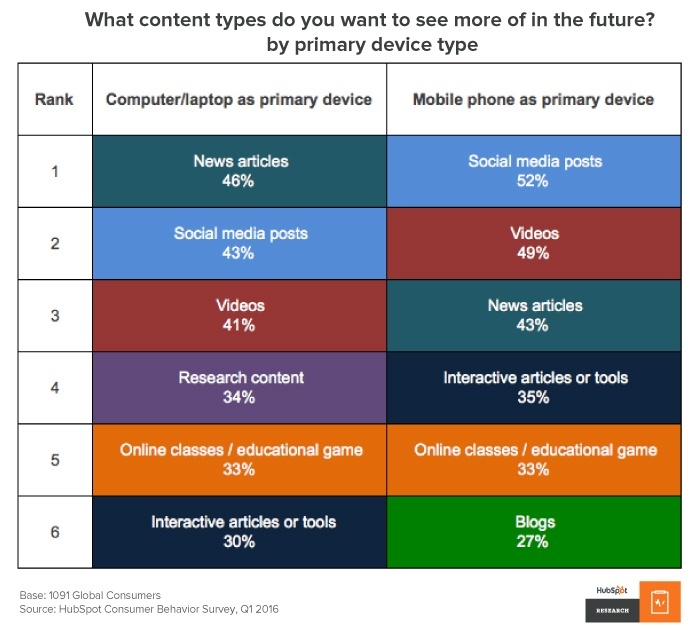 Mobile users also seek more social media and video content. They’re less likely to want long form content, podcasts, or research. Impact to marketers: Prepare a mobile strategy. Ask your web team: “is our website mobile optimized?”. Review who is coming to your most popular web pages and blog posts. Is a significant portion of visits coming from mobile devices? If so, are you offering the option to sign up for mobile notifications? Are you creating content on certain channels to specifically attract more desktop or mobile traffic? As mobile device usage increases over time, we were curious to know how many people are taking advantage of built in voice search features. While voice search technology is still being refined, we’re seeing a good deal of traction in usage amongst our survey base. 37% use Siri, 23% are using Microsoft’s Cortana AI, and 19% of those surveyed use Amazon’s Alexa AI at least monthly. These rates are sure to increase as developers improve the voice search experience. We dug a little deeper on Siri, which was the most used voice search engine in our survey, to compare regional usage. 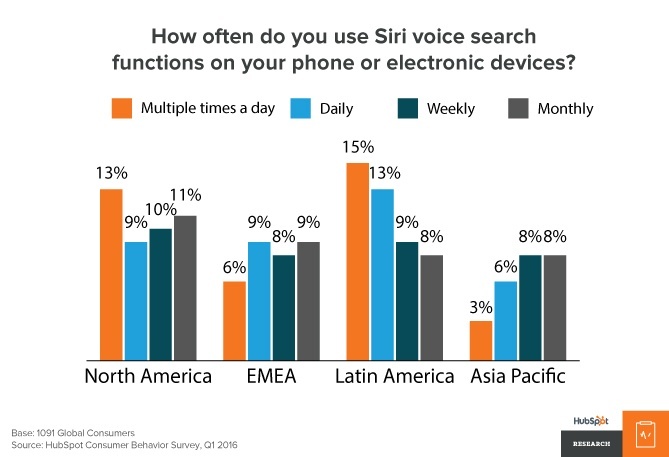 Latin America leads in adoption, with 15% of respondents indicating they use Siri multiple times a day, followed by North America. Asia Pacific and EMEA based respondents were less likely to use Siri, which is not surprising given the higher concentration of different languages represented in the region. 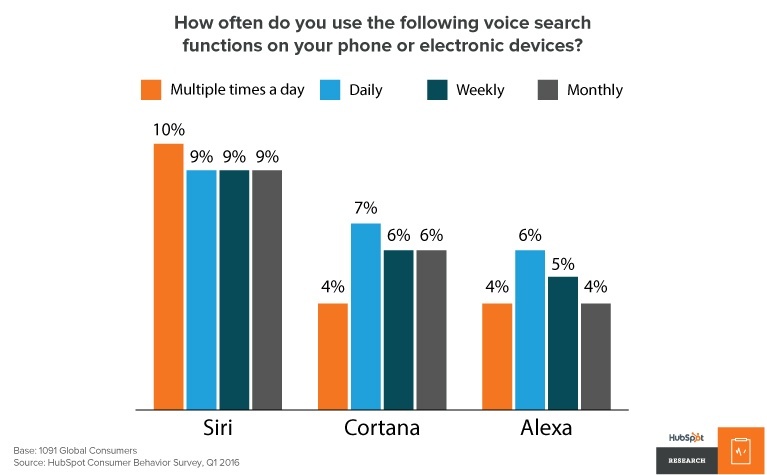 Impact to marketers: Voice search results give just one answer. What are the implications for companies who want to be the definitive source of that answer? Many are still trying to ascertain the impact a shift to voice search will have on traditional SEO and SERP but the consensus seems to be: things are going to change dramatically. Tying back to the demand for video content, 45% of our survey respondents watch an hour or more of video content on Facebook and YouTube a week. Our data shows most people pay close attention to video, which means savvy marketers can leverage videos to put out powerful, high quality content that speaks for their brand offerings. Facebook’s entry as a video content platform is relatively new compared to YouTube, but it appears they’re building viewership quickly, thanks to the fact that Facebook has 1.65 billion daily active users (as of April 2016). Facebook revealed it's users watch 8 billion videos a day, while Youtube is less specific, claiming to generate 'billions' of views a day. It's also worth noting that Snapchat, a video-based social network, has recently surpassed Facebook in terms of videos watched a day -- Snapchat users watch about 10 billion videos per day. We dove digger into the YouTube numbers, since it's a highly established video streaming website. There have been lots of commentary about cable cutting and cord cutting, especially amongst millennials. Our data confirms the trend, revealing that younger internet users are watching much more content online. As the purchasing power of millennials grow, their viewing habits will start dictating where marketers will spend their ad dollars -- on commercials for network TV shows or on video ads that play before YouTube videos? But while there has been a lot of focus on millennial behavior, a third of older generations are watching an hour or more of content on Youtube a week. Clearly, watching online video is not just a millennial pastime. People of all ages are consuming video content for significant periods of time today. Marketers who invest in producing quality video content today are best positioned to get the undivided attention of many people online. Impact to marketers: We’ve seen a lot of data pointing to growth in video. Everyone is watching it, which means most marketers will need to step out of their comfort zone and consider creating video content. As millennials, who officially the biggest generational group in the United States, accumulate greater spending power over time, marketers will have to really tackle the video channel to best reach this new class of consumers. Those who test and perfect their video strategies now will have the best chance of success in the future. Today, we’re observing initial adoption of game changing technologies like voice search and conversational UI that will impact the lives of people who access the internet. As big players like Google, Facebook, Amazon, Microsoft, even Tesla, push their innovations forward, we’re on the cusp of another major shift in consumer behavior. For businesses, many of these new technologies and resulting behaviors they will create means there will be even more channels for their products to be discovered by consumers. Since marketing is responsible for the majority of content customers access, the marketers who anticipate and adapt to these changes are in the best position to keep and grow their audience. Methodology: HubSpot Research ran an online survey via a general population panel maintained by Survey Sampling International (SSI). 1,091 online consumers from Australia, Brazil, Canada, Columbia, Germany, Ireland, Mexico, New Zealand, Singapore, UK, and USA make up the sample. The survey was available in English, Spanish, Portuguese, and German, and was fielded in May 2016.